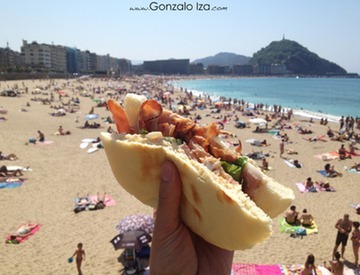 Donostia is located in northern Spain, just 20km away from the border with France, is the capital of Gipuzkoa and we could tell you thousands of wonders about its three beaches (Zurriola, La Concha and Ondarreta), about their pintxos and their cultural offer, but we want to show you another Donostia, the one that local people live day after day and which is also economical. From our hotel, you can stroll along the famous promenade of the three beaches. We reach Zurriola beach and through Paseo Nuevo we arrive at the port of the city and from there on to the beaches of La Concha and Ondarreta. Finally, we come back to Paseo Nuevo until we reach the hotel. Our hotel is located in the foothills of Mount Ulia. If you enjoy unique views(and not so well known by tourists)in the city, we recommend you to visitt he viewpoint and get lost in the innumerable path sof this mount. A bigunknown to many tourists is Monte Urgull. This small mountain has plenty of ways and nooks to discover. There, you can visit the castle of La Motaor house history. The hill is topped by the sculpture of the Sacred Heart (Sagrado Corazón) from where you can enjoy amazing view sof the city. In the harbor, you can take the boat that takes you to Santa Clara island. A haven of peace and tranquility in the middle of La Concha’s Bay. A real treat. 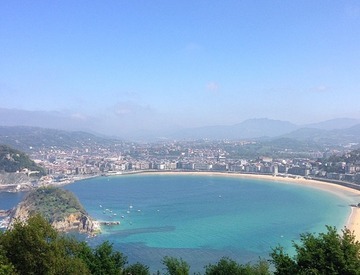 San Sebastian is the city of “pintxos” and haute cuisine par excellence. Arzak, a restaurant with three Michelin stars in the city, is located a few meters away. But it also has a wide range of cuisine suitable for all pockets. In the oldest part of the city, you can enjoy “bocatas” (sandwiches) in Bar Juantxoor rations in La Mejillonera. In Zurriola, we can get something to eat in el Campero barand enjoy the sunset in El Muro. From Monday to Friday the “PintxoPote” is held throughout the city, a gourmet “happyhour” where they give you a “pintxo” for free with your drink. Each day is a different neighborhood but Thursdays and Fridays in Gros and Egia, sweep! The city is full of events through out the year. Concerts and activities fill the cultural offerings of SanSebastián every weekend and every month, there are several events with which enjoy the city. In winter we cannot help but recommend the Tamborrada. The feast of SanSebastian is the ultimate party city or Santo Thomas, rural fair held through out the city center. From spring to autumn, Musika Parkean. 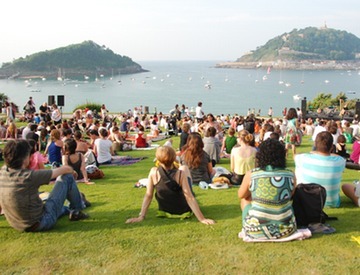 Concerts in various public parks in Donostia.You take your food and enjoy music lying on grass. Jazzaldia, in late July, has a great free music offering in Kursaal and Zurriola beach. In August, The Big Week of Donostia (La Semana Grande Donostiarra)offers many activities and a fireworks competition worth mentioning. In September, the famous Film Festival capture sall eyes with their projections and visits of well-known actresses and actors to the city and Igeldo Kutxa Kultur music festival celebrates the best of independent music.